The site opens at 7.00 pm. 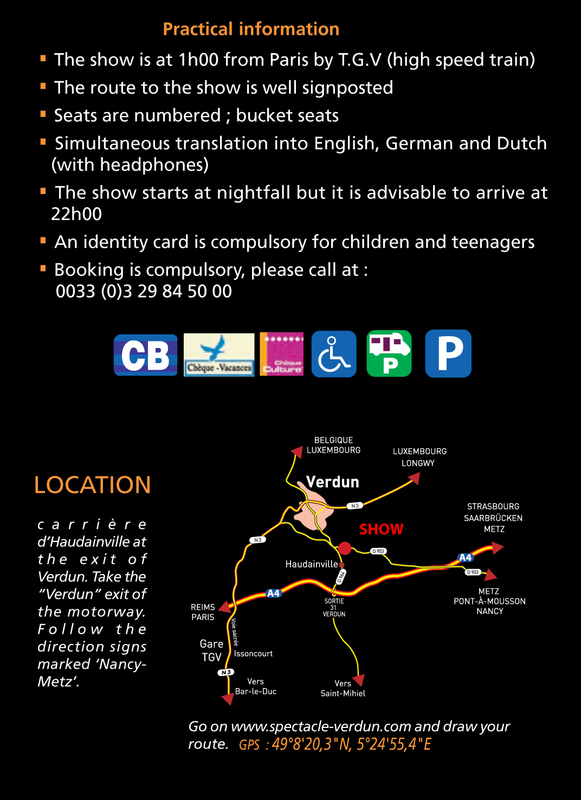 The show starts at nightfall but it is advisable to arrive no later than 10 pm The show lasts about 1:30 hour. Dinner is held under a marquee from 19:30 PM. Reservation is compulsory, please phone at: 00.33.3.29.84.50.00. There is also a bar and a terrace for having a picnic. Simultaneous translation in English, German and Dutch is available thanks to headphones. You can ask them to the attendants. Cameras are not allowed during the show. Photos and full DVD of the show are sold in our shop. Even in case of bad weather, the show is maintained out of respect for veterans. We suggest you to wear warm clothes and raincoats (umbrellas are not allowed when sitting to watch the show). Raincoats can also be bought in our shop. We strongly recommend you to reserve your seats. The bucket seats are numbered. Our team will show you where your seat is. After 22:30, the number of your seat is no longer guaranteed. Our shop offers a wide range of local products, souvenirs and books about the First World War. There is an information office on the site, where you can get plenty of information about the area. Cash, credit cards and checks are accepted. There is no cashpoint on the site. We have taken all the necessary measures to welcome you in the best possible conditions: parking, lanes, toilets, special seats. Please just let us know about the day of your coming when making your reservation. The show is unsuitable for children under 5 years old. Reservation of free children tickets is compulsory. A proof of identity will be requested for children and teenagers. For your security, animals are not allowed in the site. You can spend the night in your motorhome on the site for free, just let us know about your staying at : 00.33.3.29.84.50.00. Free car park on the site.